In 2017 we moved from our longtime office on 79th & Cicero to 95th Street in Oak Lawn near the Oak Lawn Library. Our newest location in Crete opened in 2007 and is growing fast. 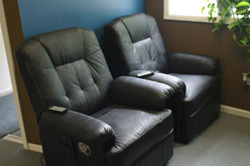 Relax in one of our massage chairs while you wait.